Here is an introduction to the different types of sling available on the market and in our library. Should you require further information about any of these slings please contact us. Buckle slings are traditionally a main body of fabric supporting baby with shoulder and waist straps that fasten and adjust using buckles and clips. They can be worn on your front or back and some can also be used in a hip carry. They can be used from newborn to pre-school. They come in various sizes including baby, toddler and pre-school, a select few last the entire time either by adjustable width panels or using accessories to prolong the optimal knee-to-knee fabric support. As the name suggests they are very structured, so aren’t very ‘free form’. Many have solid waistbands and padded shoulders which some users find very comfortable, and can have a more shaped seat for the child. Buckle slings can have many extra features such as stowaway, detachable sleephoods, seat extenders for extending the life of the sling, specific settings for newborns, stirrups for older children, pockets, crossover straps for more support in front carries and even bag clips to prevent bags slipping from your shoulder. PROS: No fabric trailing on the floor whilst you fasten the sling. Can be pretty quick and easy to put on/take off. Very structured which can give lots of support. CONS: Not all buckles suit all body types/shapes, especially on petite or larger frames, so it is very important that you try before you buy to see if it works for you. If you have more than one person using the same sling the adjustment when changing over can be quite time consuming. These slings are mostly a section/square of fabric to support the child with 4 long straps from each corner. The bottom two tie around the wearer’s waist, the top two are tied over the shoulders and tied/secured in various ways depending on user preference. They can be used in front, back or hip carry. Can be used from birth to pre-school and come in a variety of sizes including baby, toddler and pre-schooler. You can also get ‘in-between’ sizes. Tie on slings are generally of the same essential design, the main difference is panel pattern/design. The additional features you can get are sleephoods (pixie, sweat, flat), extra long straps for a greater variety of ways to secure/tie the straps, wide straps for greater weight distribution and various padded areas (straps/waist/legs-out area). You can also get a woven wrap converted into a meh dai or Podaegi by one of the many brilliant Work At Home Mums/Dads/Parents (WAHM/WAHD/WAHP) out there! PROS: Very versatile in every sense. Very quick to learn how to tie them. Widely available. Lots of WAHP made ones so can be completely customised. Less structured which some people prefer. Can fold up very small for packing away. Can have a more tailored, personal fit than a buckle sling. CONS: May look a bit complicated to use at first, however see above! Long straps can get dirty if tying the sling outside. Woven Wraps are various lengths of specially made fabric wrapped and tied around both the user and the child. They come in pretty much every colour combination and design you could possibly ever think of! There are different material blends available including linen, cotton, wool and silk, you can of course get 100% materials too. Many woven wraps are hand made, hand woven by ethically sourced workers around the world. A massive amount of time and research has gone into the development of these wraps, both in using safe non-toxic dyes and the method of weaving to ensure comfortable carrying. Wraps are woven in a specific way in order to ensure no stretch or thread shifting, both of which could lead to the wrap breaking or creating a hole/weak spot. Woven wraps do pretty much what they say on the tin and are the most versatile of all slings. You can front, back or hip carry, you can even tandem carry with just 1 wrap! Woven wraps can be used from the day your child is born right up until they no longer want to be carried. There are no upper or lower weight limits. They come in sizes 2 (2.7m), 3 (3.2m), 4 (3.7m), 5 (4.2m), 6 (4.7m), 7 (5.2m) & 8 (5.7m). The greater the wrap sizing, the more carries you can do, however shorter wraps do have the benefit of being ideal for quick carries. PROS: They look beautiful! They are possibly the most supportive type of sling as they mould to you and your child. They are massively versatile. Once you are confident with wrapping you can secure a carry start to finish extremely quickly. Woven wraps even have alternative uses such as hammocks and scarves! Many are made by small family producers so you can support a small business whilst looking stylish. CONS: They have an greater initial learning curve than other slings. If not experienced it can take quite a while to secure the carry so not ideal if you are in a hurry, this does improve with time and practice though. Wrapping outside in the wet or dirt can be a problem as the wrap can get dirty. Stretchy wraps are long lengths of stretchy fabric used to hold small babies in front carries. They generally come in one size to fit every person and come in many different colours. Some have more stretch than others, and there are differences between one way vs two way stretch but essentially all perform the same function. Stretchy wraps are ideal in front carries for small babies, and hip carries when the baby has good head control. Stretchy wraps are generally most comfortable up to approx 6/8 months dependent on the baby’s weight, or until the wrap starts to bounce or sag and cannot be tightened enough for good support. Back carries are not recommended. There is a “deconstructed’ stretchy wrap on the market called the Close Caboo, which is not wrapped around but has two pre-formed cross panels to put on like a jumper and adjusted using rings. “Hybrid” stretchy wraps also exist which offer greater support for older children and can be used in a back carry due to their unique fabric composition. The Je Porte Mon Bebe wrap (JPMBB) and Wrapsody Hybrid are the two main examples of this style. PROS: Very comfortable. Easy to use with a little practice. Provides warmth in order to have skin-to-skin with new babies. Easy to breastfeed in. CONS: Can take a little practice to tie correctly. 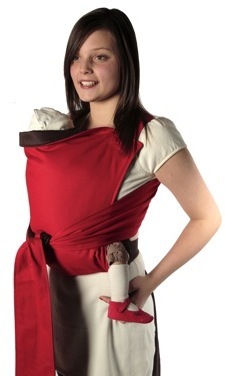 Ring Slings and Pouch Slings are worn on one shoulder with the child sitting on the opposite side or on the user’s front. Ring slings are generally made of woven wrap fabric and are adjusted and secured with 2 rings (sling rings). Pouch Slings are generally a loop of fabric made of fleece or sturdy cotton, some are adjustable with webbing and some are sized therefore not adjustable. Many people think that having the sling on just one shoulder would be uncomfortable. However the structure and weight distribution of these slings means the child is pulled into your centre of gravity, keeping your posture upright and therefore no pain or discomfort should occur. Ring Slings can be purpose-made by many of the woven wrap companies, or be converted from a standard short woven wrap. They can have different types of shoulder – gathered, pleated or padded, which you choose is entirely personal preference. They are adjusted by putting it on like a sash, then pulling the ‘tail’ of the sling through the rings to tighten the body of the sling around the position of the child. 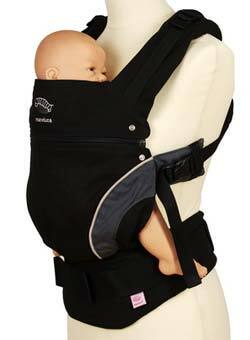 The child can sit on the front, front-side, hip or even back in these slings. They are great for breastfeeding in as you can loosen and tighten as needed to drop the child down to latch on. They can be perfect for the older child/toddler who wants to be up and down all the time. Pouch slings are purpose made ‘rings’ of fabric, usually made from fleece or cotton. They are ideal for hip carries for toddlers. When using for babies we recommend an upright position (tummy to tummy or upright reclined) rather than cradle hold as the lack of adjustability can cause problems with airflow in this position. PROS: No masses of fabric to have trailing on the floor whilst securing. Fold up very small so ideal for putting in a handbag for a ‘just in case’ situation. Loads of lovely designs. Very quick and easy to adjust and secure. Allows child to see the world ‘face on’ whilst still allowing them to take a break from overwhelming visual stimulation by turning their head towards the user. CONS: Practice is required to get the correct set up. Pouch slings lack the ability to be adjusted.